Having little ones in our lives is such a sweet joy. you can always create something memorable with them. Trace your cutie pie's hand. Cut out five hand shapes from card stock. and write them down on each hand. Poke a brad through all five hand shapes so that they can easily be fanned out to read. Make Father's Day special for that wonderful man in your child's life. Have a glorious day, my friends! My dear, dear friends, thank you for the beautiful and precious anniversary wishes. that each one of you shared. Each one of you is a sweet gift and I am thankful for YOU. I am very thankful for my blogging friends! Just enter it when you check out for 15% off your entire purchase. while wearing a delicate wedding dress, and holding a bouquet of 17 white roses. You are probably wondering why I carried 17 roses. . .
Join me as I tell the tale of our wedding day through pictures and music. . . Charge to the Couple. . . It is only by the grace of God that I have been blessed with such a special man. He is my true love, the beating of my heart, the man I admire - he is my home. My heart is so full of joy and gratitude to have seven years with my darling. for our country and our blessed freedom. It is because of YOU that we enjoy the freedom that we do. for 15% off your entire order. Plus free shipping is offered to all USA orders. This offer is good until Tuesday, May 27th. And did I mention I just listed a bunch of new items on the shoppe? Plush and pretty hand towels. And fabulous new tote bags. I have some very sad news. . .
and was heart-broken to see she has passed away. but did have the privilege of knowing her through blogging. and would then tell me she was going to play that hymn in church the next Sunday. 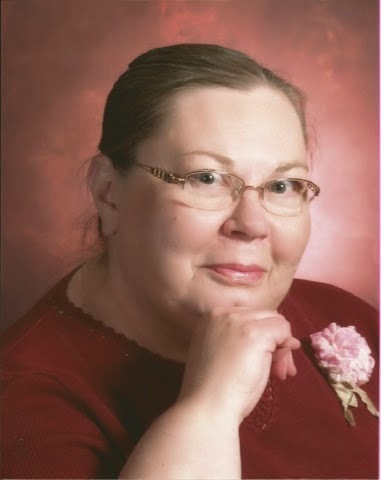 She knew the Lord as her Savior so it is a sweet joy knowing she is now sitting with Him. She will be dearly missed by many! and leave a note of encouragement for the family. Today is the start of the long weekend - yay! We are not doing much as the forecast is calling for rain all weekend long! Whatever you do, my sweet friends, I hope your weekend is beautiful. It's now time to reveal our mugs. once again there were ladies from Canada, Australia, Scotland, Germany, and England. and I am always so thankful for the ladies that join. For those of you with blogs the link-up is at the end of this post. As you scroll down enjoy looking at what the ladies without blogs received. Lets have some fun. . .
Sweet Claudia sent me a charming mug all the way from Germany! as well as a German mug. I can't wait to try both teas - one is a Pansy flower tea. Thank you, dear Claudia, for the generous and beautiful items! My heart is richly blessed. I was privileged to send a mug to a precious lady in Australia. I met Belle through the exchange and through emails we have become friends - she is pure joy! Here are the items that I sent to her. . .does the mug and mug rug look familiar? Lauren was given this extremely pretty mug from Jennifer. 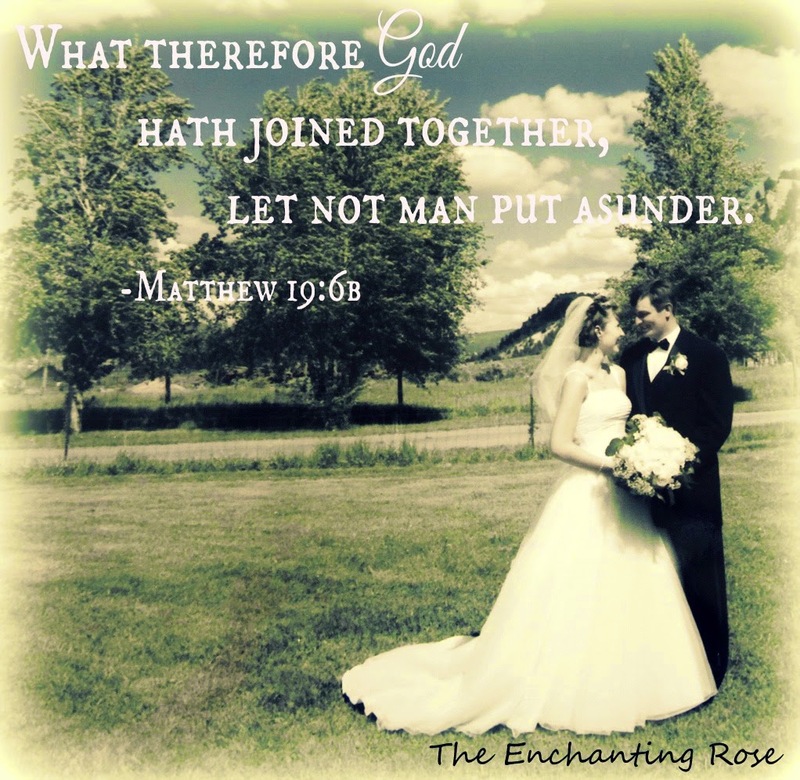 Lauren has a blog where she shares beautiful pictures along with precious Scripture. Your heart will be blessed by what she shares. 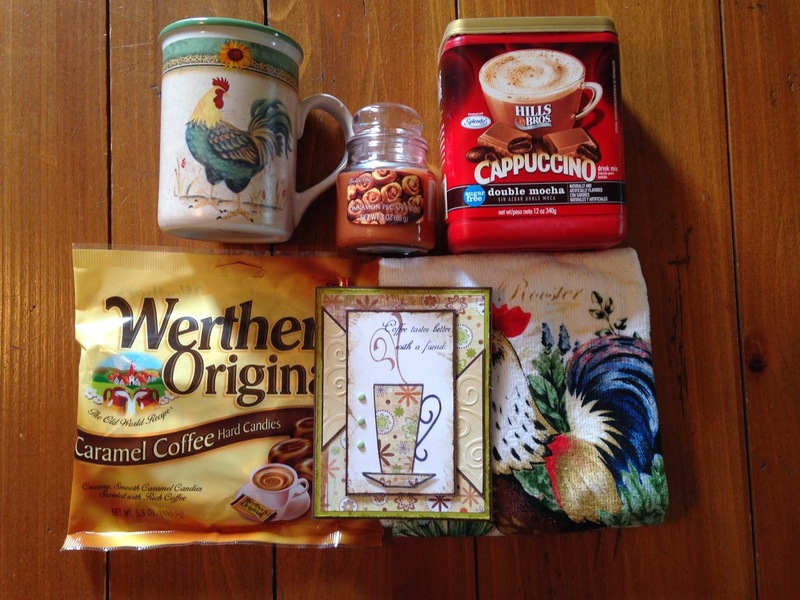 Look at these lovely items that Susan received from Lynn! I am still ooohing and awwwing over everything! Betty got this pretty mug from Susan. I see chocolates among those goodies. . .
Gina got these beautiful items from Ida - love the chicken theme! I bet that candle smells delicious! but if you have time, please stop by her peaceful place for a visit. Christine got this feminine mug and beautiful items from Belle. The blue on that mug is simply lovely! Lynn was blessed with this gorgeous mug from Debby. 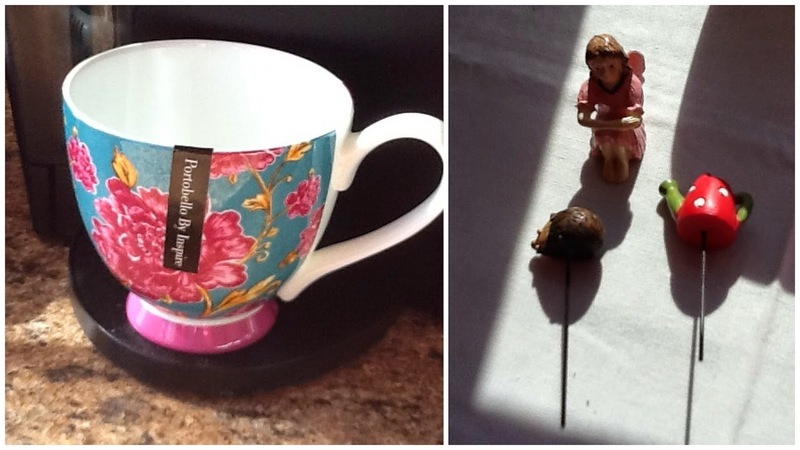 The sweet little figurines are for a Fairy Garden - isn't that wonderful! Adria was given this darling snowman mug from Gina - I love the Winter scene. Jennifer got this wonderful mug from Linda. I am loving the card and the Suisse Mocha sound delicious! Thank you, thank you, thank you to all those who participated! and enjoy a cup of coffee or tea out of your favorite mug. Wait. . .you don't have one? No worries, here is an easy and quick tutorial on how to make your own. Cut out two 5-inch squares. and sew around the entire square with a 1/8-inch seam allowance. Cut down the center of the sewn squares. and you should have 4 pieces like the below picture shows. Iron the 4 pieces open and trim the pointy corners off. Place two squares with right sides together and sew together. Sew the two strips together and you'll have your square. and 2 strips of fabric that are 8-inches x 1 1/4-inches. Sew the two shorter strips onto the ends than iron open. Attach the two longer strips and iron open. Place the square onto the batting and sew 1/4 inch lines up and down the square. (I did not want the backing quilted, just the top, so that is why I did it this way. If I were quilting a bigger piece I would have quilted the front and back). and place the backing and square right sides together. so that you can turn your mug rug right side out. Turn right side out and sew the small opening closed. and tying it into a knot. Blessings and hugs to you, friends!